Wow – what a great response! We hope you had fun with this. We wanted to use this activity as way to talk about identification, before you grab a field guide, and concentrate on plumage color. Field identification has many components to it, as we are sure any of you know who has tried to identify a bird you saw. There are many benefits to seeing the actual bird as opposed to the still photo that was posted. You get to ask yourself questions and observe things like: how fast or deep wing are the wing flaps? How does the body turn if the bird wants to change direction in flight? Does it take longer? Is it quick? Let’s apply some external factors like wind and other weather to that, too! Habitat also matters! Where did you see the bird? Was it in an open area like a field? (In this case, the bird was photographed over an open agricultural area.) Or was it more urban – perhaps on your way to get coffee or a paper? What state do you live in? And for most of us – the time of year also matters, as migration means "out of towners" and increases the chances of seeing species we don’t always encounter. Okay – let’s talk some specifics! We cannot hope to cover all the details in just one post, so we will choose a few main points. A key here for this hawk (yes, it is a hawk!) is the relatively long and narrow wing, in relation to the rest of the body. It is not helpful to think of actual length or width overall in comparison to other hawks; instead think about just the body of the bird in question. Even in a quick view, did the wing seem longer or shorter? How about the width? And let’s look at the tail – does it seem longer or shorter in comparison to the body? 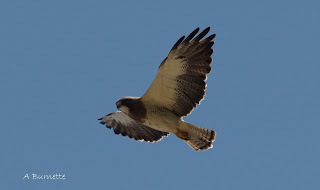 Red-tailed hawks are often a good comparison, since many of us have seen them. Does the wing in the photo seem longer in proportion to the body in the photo, than a red-tailed hawk’s wings to its’ body? How about the tail? Can you ask the same questions? The wingtips are pronounced and spread in the photo, but that does not in itself definitely help you identify the species. Birds can manipulate tracts of feathers in response to their desire to gain height in a rising column of air called a thermal, change direction, or increase speed. 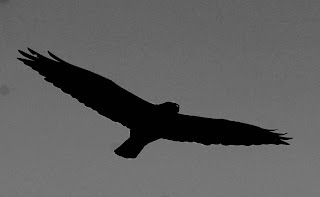 So – this same bird can change the overall “silhouette” of its wings. Don’t always assume “wingtips” mean hawk! Falcons, eagles, osprey and vultures will all utilize the same mechanics of flight. but concentrate on the silhouette. A couple of you raised the question of “hard to get size with nothing in relation.” That is true; no trees were around to help. But let’s look at an eagle for example; the overall body and wing presents as a larger bird. 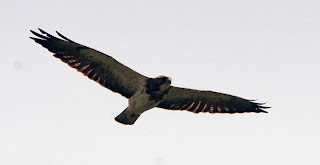 Seeing it in flight would have aided no doubt as you watched the heavier, deeper wing flaps. The wing is very long and broad. Same bird! Look at how the wings are held! Whew! Have you revised your guess at all? It is a Swainson’s hawk! It was taken about two weeks ago, in north central South Dakota. Here are some more photos of the same bird, to show you how this same individual might “appear” differently depending on which second you looked at it! 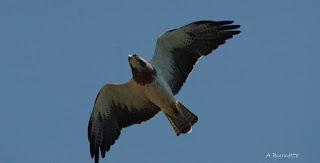 These identification tips are meant to help you, as you find raptors in your own town/state, or if you travel elsewhere. Thinking about body and tail shape, length, and using a matrix of time of year and habitat/location might give you great clues before you grab your trusty field guide!